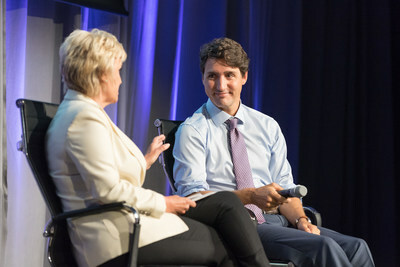 TORONTO, Sept. 4, 2018 /CNW/ - Prime Minister Trudeau will join International Monetary Fund managing director Christine Lagarde in conversation with award-winning broadcaster Katie Couric to discuss how the global economy could be turbocharged by tapping into the world's greatest underutilized natural resource: women. WITW is a live journalism platform where activists, filmmakers, CEOs, peacemakers and global firebrands share their stories and solutions in newsmaking discussions and video. "Canada is a world leader in gender equality and we're thrilled to be bringing back an even more topical and inspiring summit this year" said Tina Brown, Founder and CEO of WITW and Tina Brown Live Media. "We're thrilled to again be part of the cultural and creative fervor that overtakes Toronto during TIFF. We're especially happy to bring Prime Minister Trudeau to our stage as a world leader who is making the advancement of women a priority in his government, his budget and his foreign and domestic policy." Also joining the line-up are Foreign Minister Chrystia Freeland; Putin biographer Masha Gessen; director and screenwriter Steve McQueen; physician and ICNA Relief volunteer Dr. Fozia Alvi; bestselling author Gillian Flynn; Ugandan nun Sister Rosemary Nyirumbe; the Honourable Maryam Monsef, Minister on the Status of Women; author, actress and director Amber Tamblyn; Academy award winning filmmaker Sharmeen Obaid-Chinoy; Pam Palmater, Mi'kmaq lawyer and professor; and actress Mira Sorvino. Here is a link to the summit agenda: https://womenintheworld.com/agendas/2018-canada/ Tickets can be purchased on The Royal Conservatory webpage. The Women in the World Toronto Summit will be attended by more than 800 political and business leaders, inspiring activists and prominent members of the arts, fashion and entertainment industries. The Summit will run from 1:00 pm - 6:00 pm, and portions will be live-streamed on Women in the World Facebook page partnership with The Globe and Mail on their website. The first Women in the World Summit was launched in New York City in 2010 and has since expanded to London and New Delhi, with breakout salons across the United States in Chicago, Los Angeles, San Antonio, San Francisco and Washington, DC. 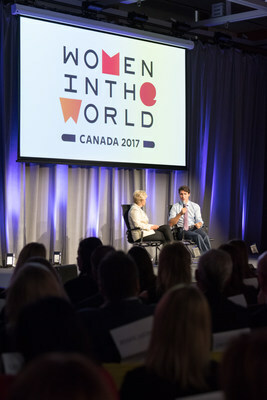 The inaugural Women in the World Canada Summit, held at the Art Gallery of Ontario, presented powerful new female role models whose personal stories illuminate the most pressing international issues. The Summit's vivid journalistic narratives, high-impact video, and fast-paced staging have made it the premier platform to showcase women of impact. Increasingly, Women in the World also includes the participation, onstage and in the audience, of men who champion women. Past speakers have included Angelina Jolie, Hillary Rodham Clinton, Meryl Streep, Condoleezza Rice, Scarlett Johansson, Leymah Gbowee, Oprah Winfrey and many more inspiring women from all over the world. The Summit is generously supported by Presenting Sponsor Credit Suisse, Leadership Sponsor P&G, Supporting Sponsors Toyota and Thomson Reuters, and Media Partner The Globe and Mail. To learn more please visit http://womenintheworld.com/canada2018 or www.facebook.com/womenintheworld.